Professor John D. Kubiatowicz considers traditionally SMP systems to contain processors without caches. Culler and Pal-Singh in their 1998 book "Parallel Computer Architecture: A Hardware/Software Approach" mention: "The term SMP is widely used but causes a bit of confusion. [...] The more precise description of what is intended by SMP is a shared memory multiprocessor where the cost of accessing a memory location is the same for all processors; that is, it has uniform access costs when the access actually is to memory. If the location is cached, the access will be faster, but cache access times and memory access times are the same on all processors." Early commercial Unix SMP implementations included the Sequent Computer Systems Balance 8000 (released in 1984) and Balance 21000 (released in 1986). Both models were based on 10 MHz National Semiconductor NS32032 processors, each with a small write-through cache connected to a common memory to form a shared memory system. Another early commercial Unix SMP implementation was the NUMA based Honeywell Information Systems Italy XPS-100 designed by Dan Gielan of VAST Corporation in 1985. Its design supported up to 14 processors, but due to electrical limitations, the largest marketed version was a dual processor system. The operating system was derived and ported by VAST Corporation from AT&T 3B20 Unix SysVr3 code used internally within AT&T. Earlier non-commercial multiprocessing UNIX ports existed, including a port named MUNIX created at the Naval Postgraduate School by 1975. In cases where an SMP environment processes many jobs, administrators often experience a loss of hardware efficiency. 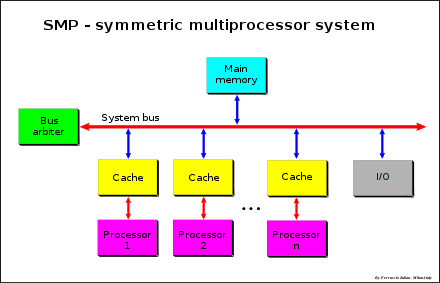 Software programs have been developed to schedule jobs and other functions of the computer so that the processor utilization reaches its maximum potential. Good software packages can achieve this maximum potential by scheduling each CPU separately, as well as being able to integrate multiple SMP machines and clusters. OS Efficiency: It is inefficient when multiple CPU cores are run at different asynchronous frequencies because this could lead to possible scheduling issues.[how?] With vSMP, the active CPU cores will run at similar frequencies to optimize OS scheduling. Power Optimization: In asynchronous clocking based architecture, each core is on a different power plane to handle voltage adjustments for different operating frequencies. The result of this could impact performance.[how?] vSMP technology is able to dynamically enable and disable certain cores for active and standby usage, reducing overall power consumption. These advantages lead the vSMP architecture to considerably benefit[peacock term] over other architectures using asynchronous clocking technologies. ^ John Kubiatowicz. Introduction to Parallel Architectures and Pthreads. 2013 Short Course on Parallel Programming. ^ David Culler; Jaswinder Pal Singh; Anoop Gupta (1999). Parallel Computer Architecture: A Hardware/Software Approach. Morgan Kaufmann. p. 47. ISBN 978-1558603431. ^ Martin H. Weik (January 1964). "A Fourth Survey of Domestic Electronic Digital Computing Systems". Ballistic Research Laboratories, Aberdeen Proving Grounds. Burroughs D825. ^ IBM System/360 Model 65 Functional Characteristics (PDF). Fourth Edition. IBM. September 1968. A22-6884-3. ^ IBM System/360 Model 67 Functional Characteristics (PDF). Third Edition. IBM. February 1972. GA27-2719-2. ^ Program Logic Manual, OS I/O Supervisor Logic, Release 21 (R21.7) (PDF) (Tenth ed.). IBM. April 1973. GY28-6616-9. ^ GE-635 System Manual (PDF). General Electric. July 1964. ^ GE-645 System Manual (PDF). General Electric. January 1968. ^ Richard Shetron (May 5, 1998). "Fear of Multiprocessing?". Newsgroup: alt.folklore.computers. Usenet: 354e95a9.0@news.wizvax.net. ^ Hawley, John Alfred (June 1975). "MUNIX, A Multiprocessing Version Of UNIX" (PDF). core.ac.uk. Retrieved 11 November 2018. ^ Variable SMP – A Multi-Core CPU Architecture for Low Power and High Performance. NVIDIA. 2011. This page was last edited on 6 March 2019, at 14:39 (UTC).